There was a castle at Cormiston which was later replaced by a mansion, neither of which remain, and the site of the castle is now next to the farm of Cormiston Towers. The earliest reference to Cormiston seems to come in the early 13th century, when a Ralph of Cormiston witnessed a charter in 1229. In the 15th century a Richard Inglis of Cormastone held the lands “in capite” from Thomas Somervill in 1415. A William Inglis of Cormastoune is listed as a witness of a charter in 1440. After this time things seem to get slightly confusing, with references to Cormiston being owned by alternately the Baillie family and the Chancellors of Quothquan. In 1467 an Alexander Bailye of Cormastoun is mentioned in a charter. Some time in the second half of the 15th century the lands seem to have passed to William Chancellor of Quothquan, who “resigned them in the hands of the superior” in 1493. William’s second son, also William, is designated “of Cormastoune” in 1516. Interestingly though a William Bailze of Cormastoune appears in a charter from 1512, and is then listed as a witness in a charter from 1513 of the barony of Douglas, Craufurd-Douglas, and the lands and castle of Tantallon from George Douglas to his son Archibald Douglas. In 1533 a William Baillie of Cormastone is listed as confirming a charter by Hugh, Lord Somerville. However William Chancellor is once again referred to as the owner of Cormiston, along with Shieldhill and Quothquan, also in 1533. Two years later William and his brother Robert were charged with the murder of Thomas Baillie, who is described as the Laird of Cormiston, so it may be that the property was at the centre of a dispute in the intervening years. The Chancellors were acquitted of the charge. William Baillie of Cormestoun Tour is mentioned in a letter from 1574, and in 1603 a later William Chancellor of Shieldhill granted the Overmains of Cormiston to a Thomas Baillie. Around the same time, John Lindsay, the 9th Laird of Covington, had a son named Rolland who was described as a “portitioner of Cormiston”, meaning that he inherited a portion of the lands of Cormiston. Thomas Baillie’s son, William Baillie of Hardington, succeeded his father in 1683, and in 1684 sold the Overmains of Cormiston to a William Aitken who later sold them back to the Chancellors of Shieldhill. The Overmains of Cormiston is probably a different property on the Cormiston estate to that of the Tower of Cormiston, and it may be that some of the confusion between the Baillies and the Chancellors and their ownership of Cormiston may be down to there being more than one property named Cormiston, or divided lands. Sir George Lockhart of Carnwath bought the barony of Covington from John Lindsay in the late 17th century, and it may be that Cormiston Tower was included in this deal, as Lockhart granted the lands of the Tower of Cormastoune to an Andrew Black by Lockhart in 1685. Black was succeeded in 1698 by his son, also Andrew, who then sold the lands to John Chancellor of Shieldhill in 1715. Nothing much seems to be written about Cormiston Tower after this point. In 1832 it is still marked as “Tower” in John Thompson’s Atlas of Scotland, but by the middle of the 19th century the castle is described as having “long ago disappeared”. By 1858 or 1859 the lands of Cormiston belonged to William Daniel Collyer, who also owned the Harperfield estate on the edge of Lesmahagow. In 1860 Collyer commissioned the architect David MacGibbon to design a new house to the north-east of the site of Cormiston Tower. Named Cormiston Towers, or possibly Cormiston House, it was described as eclipsing Balnagowan Castle in terms of grandeur. In 1882 Cormiston Tower is listed as a residence of Sir Windham Charles James Carmichael Anstruther of Carmichael, 8th Bt., along with the seats of Carmichael and Westraw House. 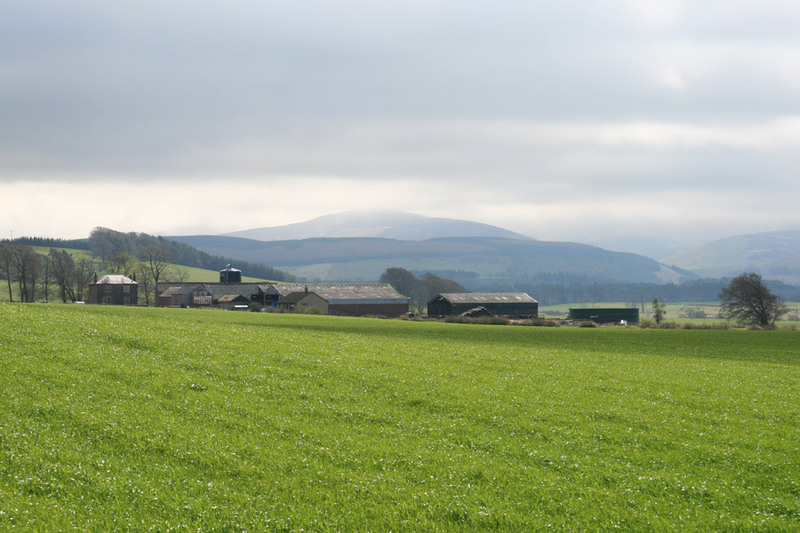 The site of Cormiston Tower now lies in a field just to the south of Cormiston Towers Farm, and there are no visible remains. The 19th century mansion of Cormiston Towers has also been demolished. Cormiston Tower is in the parish of Symington (Lanarkshire) and the county of Lanarkshire. Published on the 17th of February 2012 at 11:11 pm. Updated on the 25th of May 2013 at 11:52 pm.